(Newser) – The military-grade nerve agent that left former Russian double agent Sergei Skripal and his daughter near death appears to have been left on his front door in Salisbury, England, police say. Investigators say the Skripals first came into contact with the nerve agent at Skripal's home, and the highest concentration of it was found on the door, the Guardian reports. 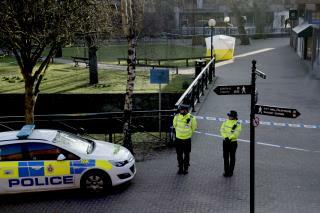 Skripal and his daughter, Yulia, were found unconscious on a bench at an outdoor shopping complex on March 4. Detective Sergeant Nick Bailey, who was hospitalized for more than two weeks after the incident, is believed to have become sick after visiting the Skripal house, where he was one of the first on the scene, reports the Telegraph. The Britain got no whatsoever credibility left since Iraq war falsehood. These re all fabrications and total falsehood like that Saddam Hussein will use nukes in five minutes with mobile nuclear armaments units. Remember? Expelling diplomats is a mere slap on the wrist in my opinion. There is currently no incentive to refrain from doing this same thing again in the future. So, how did Putin know exactly where the man lived?? I thought former spy's and what not, were given new identities and all that? Check the basement, see if there's a secret lab, because it strikes me that the chemicals aren't so much going into the house, but leading out of the house, since the trail leads to that car park, where the spy was seen with that other person who hasn't been tracked down yet.